The 4th-ranked Oregon Ducks continued their mastery over the Stanford Cardinal with a three-game sweep at Jane Sanders Stadium, 8-4, 4-1 and 4-1. In a bit of a wrinkle Miranda Elish opened the series in the circle for head coach Mike White. After Megan Kleist spun a 1-hit, “no-hit” 5-0 win against Oklahoma the night before, White was anxious to see if Elish could extend her effectiveness to a second outing in a weekend series. The sophomore right-hander scattered six Cardinal hits, struck out twelve and overcame three errors by her defense in the 8-4 win in the first go-round. A six-run second inning triggered by D.J. Sanders’ bases clearing double gave Elish all the runs she would need, though the Ducks tacked on single runs in the third and the fourth. Errors gifted the Cardinal a pair of runs in the third and Stanford plated a couple more in the 6th, touching Elish for back-to-back doubles before she retired the side. 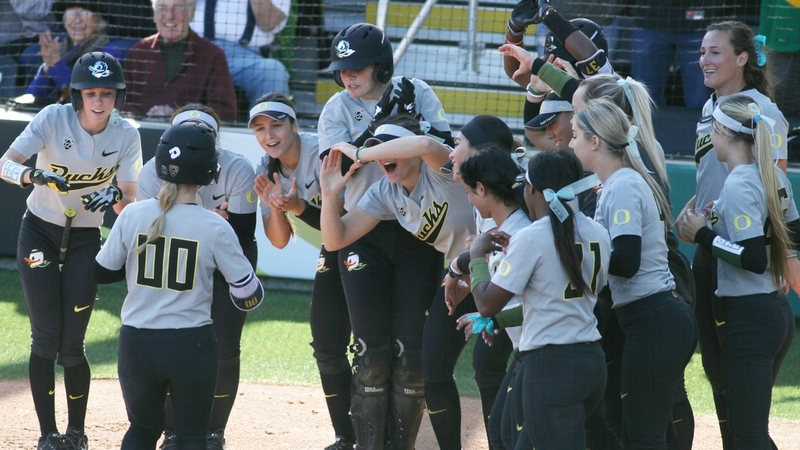 Kleist returned to the spotlight in game two and after being victimized for an unearned Stanford run in the top of the first, watched Jenna Lilley knot the score in the Ducks’ first at bat on a liner over the right field fence. Alexis Mack reached base in the third on an error, advanced to second on a ground ball then scored on a single by Gwen Svekis. Mary Iakopo doubled but Oregon was unable to do any more damage when Mia Camuso fouled out. 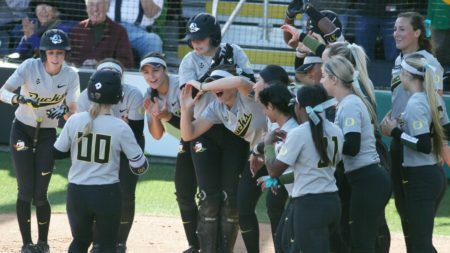 Missed chances was something of a theme as the Ducks stranded eight runners and missed opportunities break the game open when the Cardinal held Oregon to single runs in the fifth and sixth inning. Not that Kleist hadn’t already locked the game down; giving up six hits and striking out seven without a walk to improve her season record to 15-5. Iakopo led the way with a 3-for-3 day at the plate and freshman Lauren Burke picked up a pair of hits and an RBI after being given the start in right field. Leftfielder Haley Cruse added a 2-for-3 day to the attack. Elish wrapped up the sweep with a complete game, two-hit outing on Sunday. Fanning ten Cardinal hitters along the way, Elish (16-1) surrendered an early 1-0 lead in the fourth when Stanford shortstop Whitney Burks roped a 2-1 offering into the right-center field seats. The Ducks answered right back, scoring all four of their runs in the home half of the inning. With two outs and Cherish Burks on second base, Cruse singled scoring Burks to give the Ducks a 2-1 lead. Shannon Rhodes recent struggles at the plate was the reason White had turned to Burke to add some pop to his line-up but now as a pinch hitter for Lauren Lindval, Rhodes could seek some redemption. After Cruse stole second base, redemption was hers on a 3-2 blast over the left field wall. Game, set, match, series Ducks. With a season mark now at 38-7 and 12-3 in conference play, the Ducks next head to Seattle for a season defining series with the Huskies. Until this week ranked #1 in the country, Washington was being swept by UCLA while the Ducks were polishing off Stanford for the 19th consecutive time. The Bruins and the Ducks sit atop the conference standings with Washington now two games back. Friday’s game one will be available only on the Husky live stream; game two Saturday and Sundays’ finale will be televised by ESPN2 beginning at 1:00 pm.